Mindy's fitness Journey: Citi's Every Step of the Way and $25 Visa Card giveaway! Citi's Every Step of the Way and $25 Visa Card giveaway! Athough the Olympics are over, the Every Step of the Way campaign is still going strong. Citi has joined forces with some amazing olympic athletes. You can vote to award Citi's $500,000 donation to the 9 community programs in need. Anyone who follows the winter games remembers this name and probably the picture below. 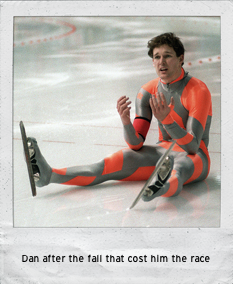 In 1988, Dan lost more than just his chance to medal in the speed skating event in the Olympics, he lost his sister, Jane to cancer. The morning of his big race in Calgary, he found out that Jane had lost her battle with cancer. his dream of winning a medal. I was 14 years old and I remember sitting on the couch crying with my mother. America mourned with Dan that night. Our hearts were broken for him and his family. I had been following Dan's story, and I thought he was awful cute (his picture was on my locker door...) I couldn't believe I was watching this. What happened to Dan makes him a true hero. His story is timeless and is one that I personally enjoyed sharing with my 10 year old son. I think it is important in athletics that we focus on the good and resilient people who have such inspiring stories to tell. These are the heroes our children need to know about. Now head on over to https://everystep.citi.com/#dan and vote for Dan or to https://everystep.citi.com and vote for your choice. GIVEAWAY TIME! Who wants to win a $25 Visa Gift Card? You must comment which Citi athlete/community program inspires you the most and visit the Every Step of the Way website to vote. Tell me who you voted for. What is Citi's Every Step of the Way Campaign? I totally remember the Dan story. I Loved him! I vote for Picabo Street! I vote for Dan Jansen. Love and voted for Dan. I remember following his story!! Such inspiration! I most definitely voted for Dan. Knowing hard times personally, and how especially hard it is to continue working toward a goal when finances are already tight, then life happens, there should be some type of grant or assistance available when any type of crisis (environmental, health, etc) strikes for an athlete to continue on their road to training. I voted for and the story that most inspired me was Ted Ligety: Youth Enrichment services to help the urban youth have a chance to ski and snowboard. I voted for Picabo Steet. She is very inspiring. Lets hear it for the ladies Julie Chu is totally right.